A British court has concluded, using civil standards of proof, that Vladimir Putin approved the murder of a Russian whistleblower, Alexander Litvinenko, in London. The Litvinenko case comes as close as possible to proving Putin’s guilt. It identifies the assassins beyond a reasonable doubt and proves that Putin’s KGB state has officially shielded the murderers and has obstructed justice, making Putin a likely accessory after the fact. Putin’s KGB state knows (if it wishes to) who its political murderers are. The long list of unsolved political assassinations therefore proves the Kremlin does not want any of these cases solved. As the list of murders has grown without resolution, the court of international public opinion understands that the state murder is a standard instrument of Putin’s KGB state. Central bankers and the financial press worry about deflation. They aim for a moderate amount of inflation and then worry when their “inflation targets” are not met. Deflationophobes link deflation and recession. They point to stagnant Japan as an example of the ravages of deflation. The modern macroeconomics of rational expectations – for which a number of Nobel prizes have been granted – teaches another story: Only unanticipated inflation/deflation is supposed to affect the real economy. Few economic writers bother to look at numbers, which are now easy to gather with a substantial number of easily accessible data bases. 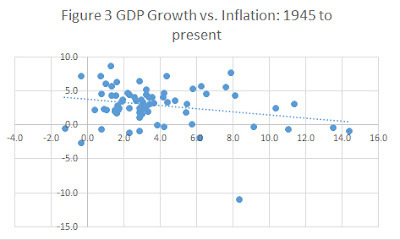 In the four diagrams below, I plot scatter diagrams of the annual rate of inflation versus the annual real GDP growth rate. Three are for the long run (1909 to present) excluding World War I and II. 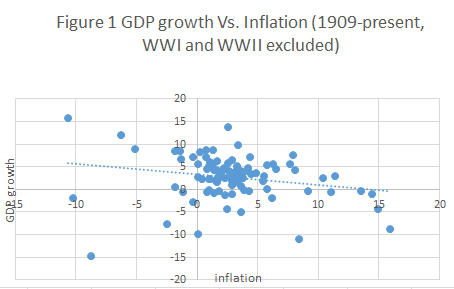 One correlates inflation with growth. Another correlates expected inflation (a 3-year moving average) with growth. A third correlates inflation/deflation with growth for the postwar period. 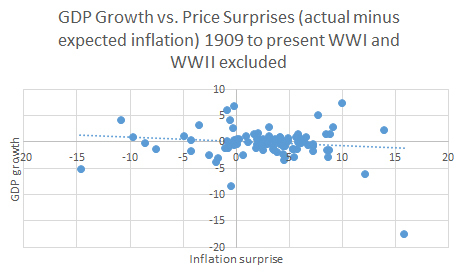 A fourth looks at growth and "price surprises." 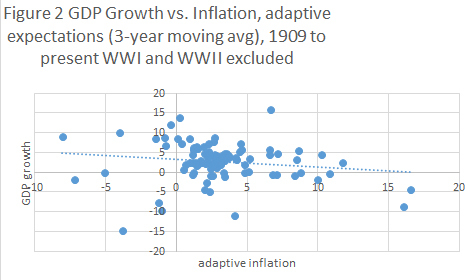 None seems to show a relationship between price changes and economic growth. Note that these are simple diagrams. There is no econometrics or fancy statistics, but usually simple approaches will pick up strong relationships. 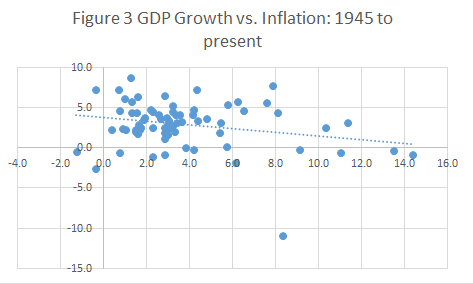 As is evident from the data, it is hard to detect any correlation between inflation and growth. Perhaps our central bankers and economic pundits should reexamine their views. Vladimir Putin’s praise of Donald Trump as “a very outstanding man, unquestionably talented” has been reciprocated by Trump’s calling Putin “a man so highly respected within his own country and beyond” that they “would get along very well.” Trump has shrugged off warnings of Putin’s perfidy by citing lack of proof that Putin “kills journalists, political opponents and …invades countries.” Only the naïve would know there will be no such proof when the Kremlin controls prosecution, justice and the secret police. Putin’s hybrid warfare and its plausible deniability complicates proof of crimes against the international order, despite obvious Russian military engagement in Georgia and Ukraine.